The Taylor 114 Grand Auditorium Left Handed Acoustic guitar embodies all the best aspects of the standard Taylor 114 Grand Auditorium besides having the added advantage of being strung for left-handed players. Can life get any better? Taylor believes that just because a player is left-handed doesn’t mean that they should have to do with a lower quality guitar. To meet their left-handed customers’ needs they’ve come out with a number of left-handed acoustic guitars; just one more fact that makes Taylor one of the companies with the best acoustic guitars for sale. The rich, woody tone of the 114 Grand Auditorium leaves no doubt in your mind that this is going to be a guitar that you are going to want to hang onto. And the ease of play on this baby makes it feel as if you have finally come home. One suggestion would be to replace the strings that the 114 comes with or you may find yourself initially disappointed at the rather tinny, “crisp” tone they produce. But with the right weight strings, you will bring out the very best in this beauty. Made with a solid Sitka spruce top and laminated sapele back and sides, the Taylor 114 is everything you expect from a Taylor. And at $649, is an affordable alternative to the incredibly expensive left-handed guitars made by some other companies. Why on earth would you want to pay more? The Taylor 114L is no longer manufactured. 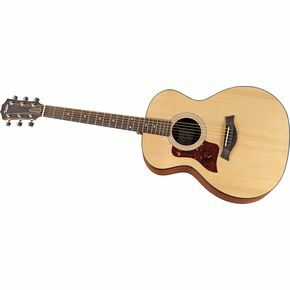 Try the Taylor 214e-L Grand Auditorium Left-Handed Acoustic-Electric Guitar.